I have found some strange ways that people obtain bed bug infestation. 2. and also picking up used furniture. However there are many ways you can pick them up. I had one young lady that lived in a small condo by herself. She found 4-5 bed bugs and had been fighting them for a few weeks. Finally she gave up and called us in. I found a few but it was a little odd in that they were nesting more in the den than bedroom. I asked if she traveled – No I asked if she had brought any used furniture in – No She had no neighbors with a problem. I then asked if she can think of anything that she had brought in her unit in the last couple of months. When I said that she looked over at a painting on the wall. She said “I just thought about it and you know I bought this painting on Ebay from a man in Canada.” I went over and took it off the wall and there were 4-5 bed bugs behind it in the frame. There was also a significant amount of excrement behind it. So she bought an infested oil painting and paid for shipping that started her infestation. I have had multiple customers that are convinced they got them from a do-it-yourself moving truck. You have no idea what was in that truck for the last few weeks. Commercial Moving Companies are having problems with bed bugs. Furniture Delivery people are now not taking used items back. Even new furniture can be infested if stored with infested items. Visitors bring them in. Unfortunately you can have people into your house that have infestation at their house. The Bed Bug eggs can be easily spread from one home to another. We see it all the time. One family member gets them and they spread to other family members homes. This Christmas we fully expect to get some calls a few weeks later where bed bugs have been brought in by visiting family or friends. I hear people blaming the hotels. But people brought those to the hotel. Until the hotel knows about it all they can do is be proactive. They can’t inspect every bag and item that is brought in. These extended stay hotels seem to have the worst problems which makes sense. You need to have a general idea of what bed bug infestation looks like and do an inspection when you first get into the room. If you will check behind the headboard that is a common place we find them in hotels. Look for the Black Excrement (Sharpie Markers) like in the picture above as that is their signals. If you are having a problem with bed bugs in the Atlanta, Savannah, Macon areas give us a call at 770-957-1915. We have inspectors that will come over and do a free evaluation, If, and only if bed bug evidence is found we will give you an estimate for Thermal Remediation Electric Heat Treatment. We heat the infested treatment area up to 130-135 degrees. We also use fans to distribute the heat and point it into closets, towards drapes, etc. Bed Bugs have no resistance to temperatures above 118 degrees. The adults will start dying immediately. The eggs however need to be exposed to the heat for at least 2 hours to make them unviable. Even fairly heavy infestations can be eliminated in one treatment. Also we offer a 90 day warranty on our treatments and stand behind them. 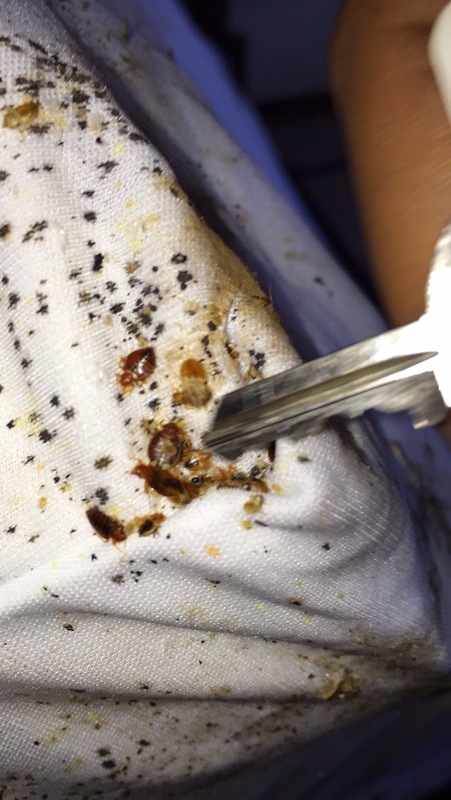 Bed Bugs in Atlanta, Georgia. Detect with Sensor Bed Bug Dogs ! Thermal Heat Treatments ! 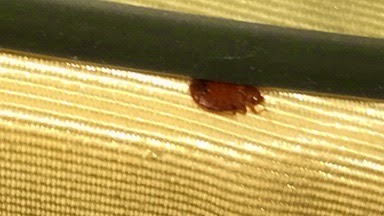 I suspect that I have Bed Bugs in the Atlanta Area. What Do I Do ? First of all you need to be sure that it is bed bugs. There are other insects that bite. There also are other situations that can simulate a bite. 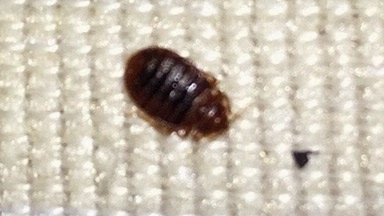 This is a picture of a typical adult bed bug. The little black stain is an excrement mark. Bed Bugs only feed on blood so their excrement is a liquid and soaks into cloth making a “Sharpie Marker” type stain. You should check around the bedding,headboard and mattress seams first. Why ? Because if you find them there you can stop looking. The First Step is over when you have found live infestation. If you don’t see any signals you can at that point continue further or call in a pro. Try not to disturb the situation if you are planning on calling in a pro. If you are going to tear into it I recommend having some alcohol spray and a ziplock bag nearby. If you run into a nest you want to contain them and kill them immediately. Also save some specimens. We have recently found a monitoring device with a lure that works very well. This can help with an ongoing monitoring program. The lure is placed inside the station. the lure mimmicks the human skin which attracts bed bugs into the device. The lure according to the manufacturer lasts for 90 days. It can then be replaced to have a constant program. We can give you an estimate based upon the units and amount to be monitored. This device is called Sensci. Once you have determined you have activity I suggest you call in a pro. Why? Because spraying and dusting and fogging can be very dangerous and also ineffective in dealing with Bed Bugs. It actually can make the problem worse. If you kill 50% of the adults but they spread because they were disturbed have you helped or hurt the situation ? If they are only in the bedroom lets keep it that way until the treatment is completed.. Below is a picture of an infested mattress with encasement on it. A pretty bad one. Thermal Remediation Heat Treatments are the Best Method Available. If you have a small house or apartment it is better to of course treat the entire unit. For Instance if you have a house that is 1300 sq ft and Bed Bugs are found in a bedroom and the couch area. We would always treat the entire house in this situation. If that same situation occurred in a very large home then sectioning is an option worth considering due to cost differences. Our Truck and Trailer units all have generators installed to produce the power for the Electric Heating Equipment. We bring the correct amount of equipment to the job site and set up outside. We then run a cord from the generator into the residence usually through a window opening and then seal it. The Heaters are placed strategically throughout the area of treatment. The heaters are then turned on and heatup starts. It usually takes about an hour or so to heat the area up to 130 degrees. We stay between 130-135 and hold for 4 hours. 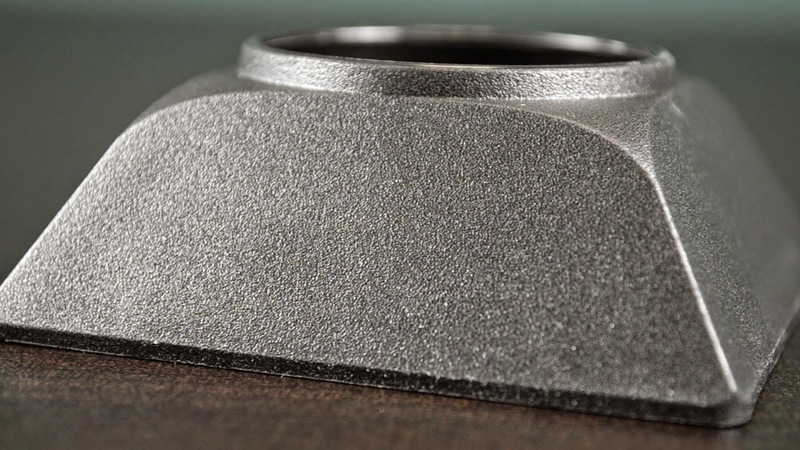 High speed fans are introduced to get the heat moving thus entering cracks and cloth. During this heatup time we treat around infested areas with Sprays and Dusts to give us additional protection and some residual. Electric Outlet plates are a common hiding place for bed bugs. Also picture frames close to a host area is a high risk nesting area. At the very end of the treatment while we are putting the beds back together we install encasements on any box springs and mattresses that are going to be kept. Bed Bugs can not endure temperatures above 120 degrees. The adults will die within a few minutes of being introduced to the heat. The eggs however need to heated for at least 1-2 hours to make them unviable. Because of cloth thickness and clothes we found that holding the heat for 4 hours has helped us to not have reinfestation. If you need help with Cimexa – Bed Bugs in the State of Georgia give us a call and we will be glad to help you with information so you can make a good decision about what to do. We are very cautious about treatment until activity has been confirmed. If you use a K-9 Service do not treat without visual confirmation. We have a K-9 service but do not use it from a sales standpoint. It is a tool that we use to help us locate visible evidence. In large homes it can be a very helpful tool in possible sectioning situations. Call Us Today at 770-957-1915 and we will be glad to discuss bed bugs with you confidentially.